Projects Abroad Director, Dr Peter Slowe, hosted a dinner at the Reform Club on 18th December for the Rt Hon Ben Bradshaw MP, Secretary of State for Culture, Media and Sport. The annual George and Rita Briton Cup tournament, organised each year by Projects Abroad, took place on December 4 and 5, 2009 at the Prisons Park in Accra. Tom Davies, Country Director of Projects Abroad Ghana explained that the event forms part of his outfit's social responsibility to develop local talent. Today the mother city of South Africa, Cape Town will host the draw for the 2010 World Cup. This promises to be a vibrant traditional African affair welcoming the competition to the continent for the first time in history. Seventeen years after we founded Projects Abroad, we have started Projects Abroad Pro. We are bringing all our experience and expertise, and all our contacts and influence, to ensure that volunteers with recognised skills and qualifications can contribute meaningfully in a wide variety of placements all over the developing world. Volunteers, staff and players gathered bright and early one morning last week by the side of the pitch at Cantonments Football Club in Accra, Ghana. The task for the day was not about winning matches, but rather coming together to help the local community. Cambodia Conservation Project Finds New Species of Nudibranch. On Monday 3rd August, Projects Abroad held an information evening for people considering the possibility of volunteering with Projects Abroad overseas. The evening was held at BHASVIC College and attended by around 40 people. The greatly anticipated visit of U.S. president, Barack Obama and his family to Ghana on 10th and 11th July was met by much excitement as this was to be the current president's first visit to Africa while in office. Things have been very busy at the Taricaya Lodge these past few months and the team out there doesn't stand still for long! We are starting to work with Leona Lewis's voice coach Janet Edwards. Since Leona came to prominence, a key to her success has been the work that Janet has done to develop her vocal skills. 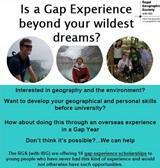 The Royal Geographical Society with IBG will be running two half day courses on Geo-Blogging at the end of January with the aim of equipping students/people planning expeditions/Gap Years with the means of communicating them effectively to the masses.